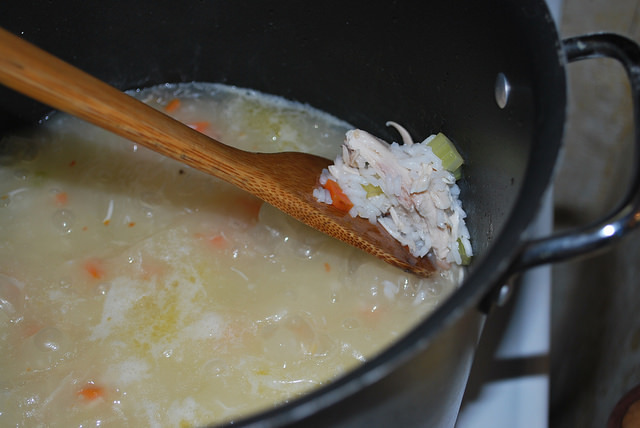 This simple 6 ingredient Chicken Rice Soup is so delicious and very easy to make. It does take a little time, but it is well worth it and we usually have enough left over for at least another 5-6 servings. Sometimes we will put it in a container or a few smaller containers and freeze it. It reheats easily in the microwave or the crock pot (make sure to add a little bit of water if reheating in the crock pot). For one serving in the microwave (if frozen), I usually cook about 4-6 minutes on quick/express defrost, stirring (or trying to stir) every 2-3 mins., then on high 1-2+ mins as needed. 1 Whole 3-4 pound roasting chicken (or other bone-in, cut up chicken with skin). 1 ¾ Cups of dry white rice. About ½ teaspoon crushed red pepper flakes. About 1 ½ teaspoons Garlic salt. 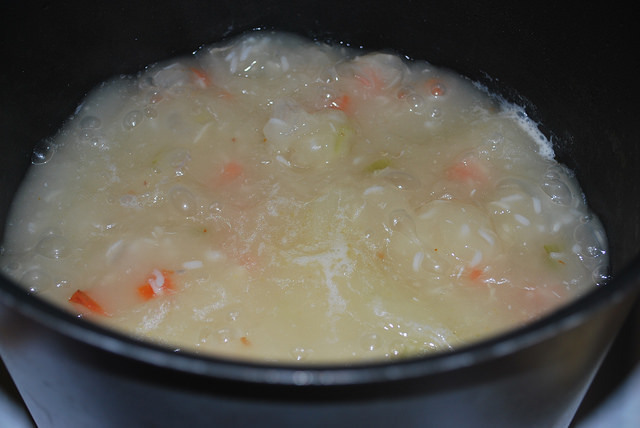 To start your Chicken Rice Soup, you will need a large Stock Pot filled about 3/4 full with water. This will be the only pot you will need to cook the Chicken Rice Soup (yay, easy clean up!!). You can add some salt to the water if you prefer, but it isn’t necessary. While you begin to heat the water to a boil, add in the whole roasting chicken. You can also use any other bone-in cut up chicken (especially if you prefer only white meat chicken). The local grocery store here sells cut fryer chickens, but the whole roasting chicken was only $0.99 a pound, so we went with that! Either way, you will need about 3-4 pounds of chicken with the bones and skin. 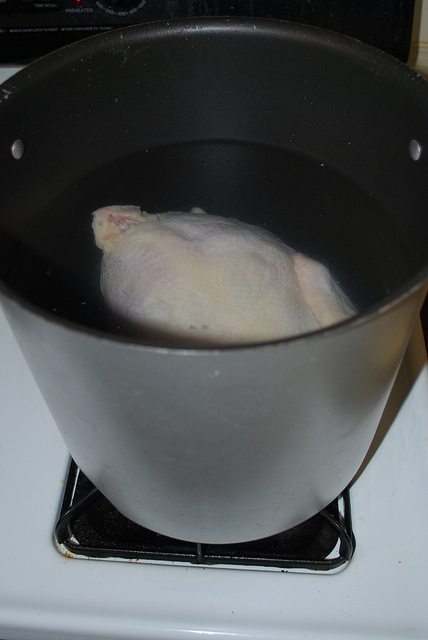 Boil the chicken in the pot for 1½-2 hours, keeping an eye on the water level as it cooks, being sure that the chicken is covered in an inch or two of water. 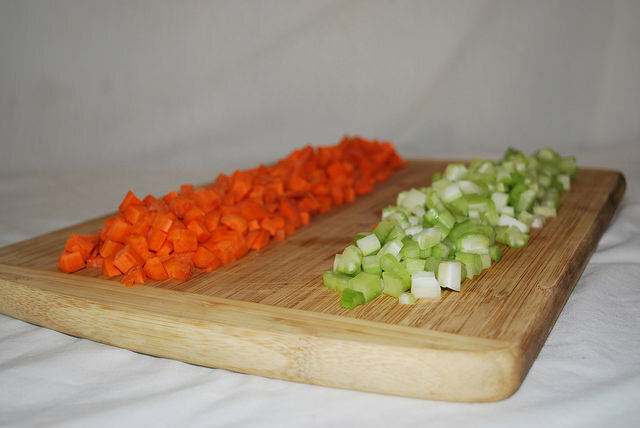 While the chicken is boiling, dice up the 2 large carrots and 2-3 celery stalks. When the chicken is done cooking, carefully remove the chicken from the boiling water and set on a plate to cool down. At this point, you may need to add more water, about half of a pot full. Then bring the broth back up to a boil. 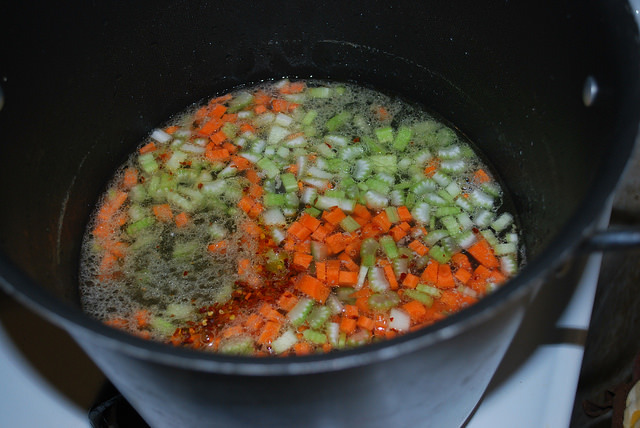 The next step for your Chicken Rice Soup is to add the carrots and celery to the boiling water. Boil them until they are tender, about 8 minutes. When the veggies are done, if the chicken is not yet cool enough to handle, you can turn them off. Once the chicken is able to be handled, turn the water back on to boil and start removing the skin from the chicken (you can toss that in the trash – it’s done its job of adding delicious flavor to the broth!). Then, pull apart the chicken and remove the meat from the bones. Break or cut the chicken into small chunks and add back in to the pot of boiling veggies. Now that you have your chicken added to the pot, you can add the 1 ¾ cups of rice into the water. At this point, also add in ½ teaspoon of crushed red pepper flakes and 1 ½ teaspoons of garlic salt. Then boil the soup for 30 minutes, stirring occasionally. Again, keep an eye on the water level and add in as much as you need to achieve your desired consistency. Make sure to taste the soup stock to see if it needs more garlic salt or red pepper flakes. Add in carefully, as a little bit goes a long way! I would suggest by the 1/2 teaspoon or less. Typically we need to add a little more of one or the other into our chicken rice soup, but this is a good base ratio for those that like their spices a little milder. We serve the soup with the garlic salt and pepper flakes at the table, so that everyone can season to their liking. 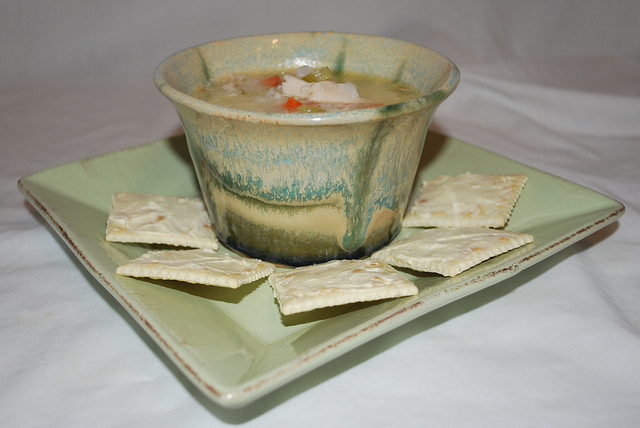 We also like to serve our Chicken Rice Soup with buttered saltine crackers on the side (I like to add a little scoop of soup on top of the cracker and eat it). They add a little crunch and make a great addition to the meal. What’s your favorite soup that you like to make for dinner? Comment below, we would love to know. Please don’t forget to like and share with your friends. Tagged Chicken rice soup, Dinner, dinner ideas, dinner sides, lunch, Recipe, Soup. Bookmark the permalink.